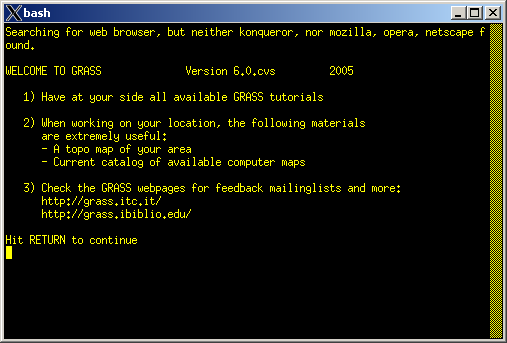 GRASS is an Open Source GIS which is released under the GNU Public License. Its development is currently being done worldwide. 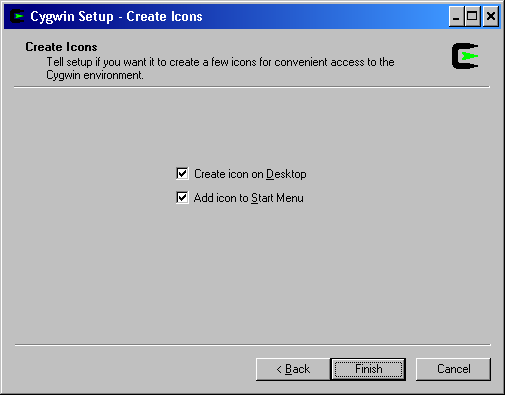 NOTE: MS-WINDOWS USERS ARE RECOMMENDED TO INSTALL THE LATEST VERSION OF winGRASS/Cygwin. THE PACKAGES IN THIS PAGE HAVE NOT BEEN MAINTAINED FOR A WHILE. If you have already installed the first release (2006-09-13), please update grass/gdal-1.3.2-1.zip and grass/sqlite-3.3.6-1.zip too. Download these files along with grass/grass-2006-09-17.zip and uncompress/overwrite old files under C:\msys\1.0\local. Create a shortcut to grass.bat with a cute icon. 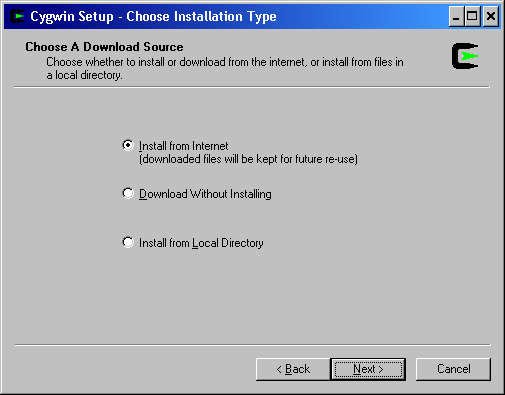 Choose the default directory C:\MinGW. http://xoomer.alice.it/hherold/wget-1.10.2b.zip: copy and paste this URL to your browser, or go to http://xoomer.alice.it/hherold and download 1.10.2 complete. You have successfully installed GRASS. 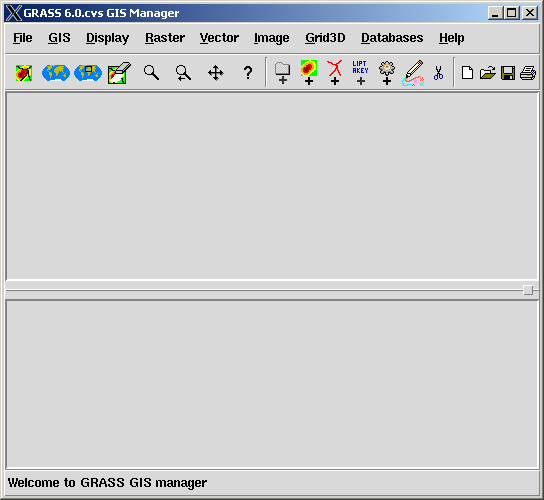 Run C:\msys\1.0\grass.bat to start the GRASS GIS Manager. You can create a shortcut to this file with a GRASS icon (C:\msys\1.0\grass.ico). Updating GRASS is a lot easier than the first install. 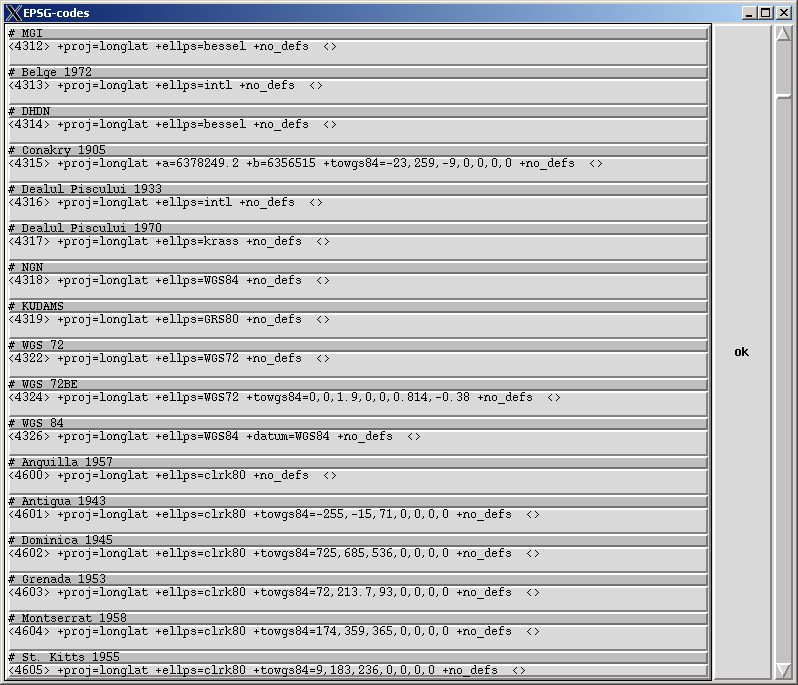 Just overwrite old GRASS files by uncompressing grass/grass.zip under C:\msys\1.0\local. 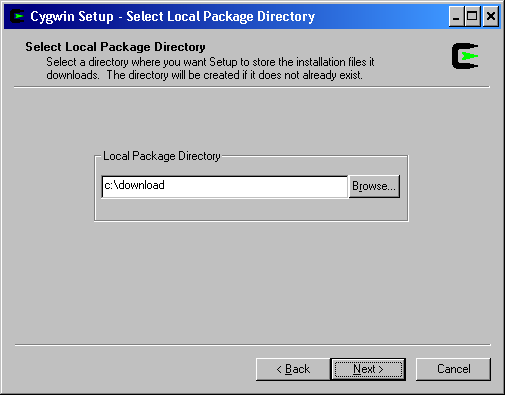 Unless you're told to do so, you don't need to reinstall other packages. Successful compilation does not necessarily mean that you can run all the modules in the package without any problems. Since it's the first release for Windows native GRASS, extensive testing is mandatory. If you have problems or find bugs, please let me know. If you're not familiar with mailing lists, visit my wiki page. Please read WinGRASS Current Status. 6.1.CVS (grass-cvs) April 17, 2006 updated! 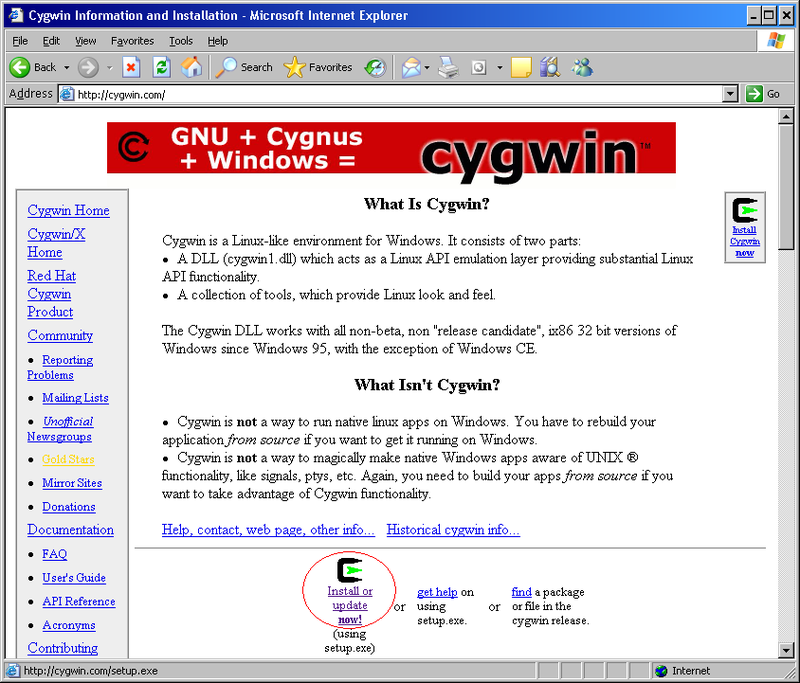 Go to http://cygwin.com and click setup.exe. 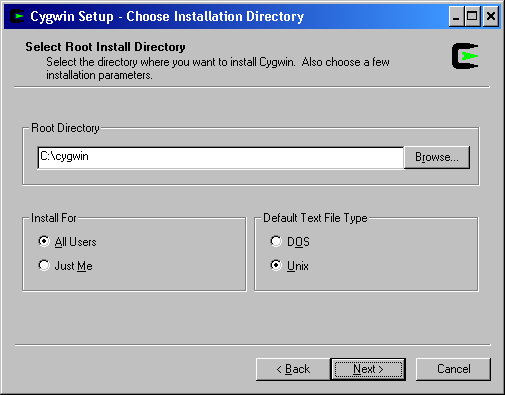 Choose the UNIX file format and install cygwin under a directory whose name doesn't contain spaces or tabs. Add http://geni.ath.cx/grass to the user URL list and select it. This will install GRASS packages. Choose one of download sites other than http://geni.ath.cx/grass (Use Ctrl+Left mouse button). 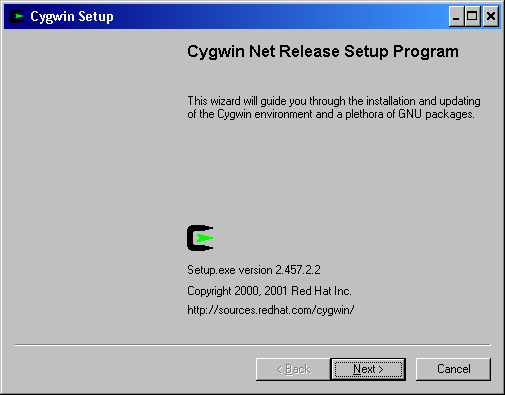 This site installs Cygwin packages required to run GRASS. So two URLs should be highlighted: one, http://geni.ath.cx/grass, is for GRASS installation and the other one is for Cygwin stuff. 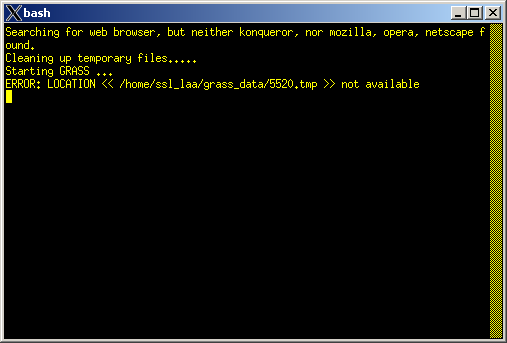 Goto Database and select GRASS. 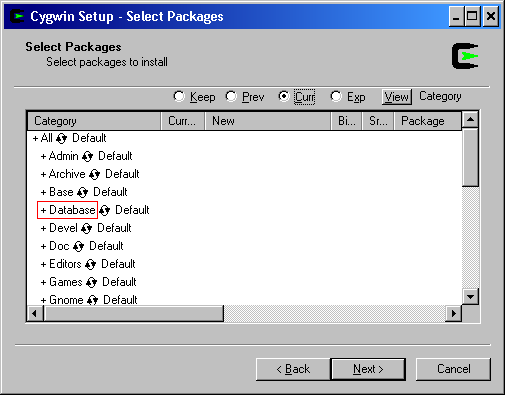 grass-cvs (latest version) is recommended over grass (6.0.0, outdated release version). Install. Now, setup.exe is finished. Copy grass60.bat to c:\cygwin and run it. You may want to make a shortcut to c:\cygwin\grass60.bat. grass.ico by John Robertson is also available. Welcome to GRASS GIS! Now, it's time to create a new location. For more detail about the EPSG code, refer to epsg. 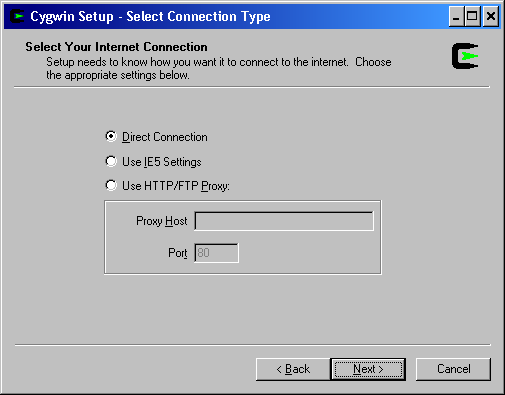 Input the EPSG code for your location manually. Restart grass60 and select the previously created location. You're in the GRASS GIS Manager. If it doesn't work, please let me know. 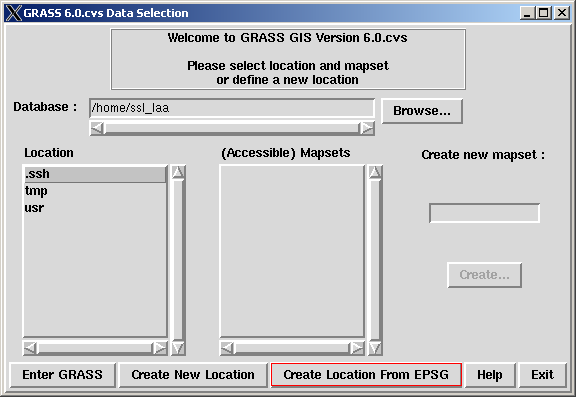 You don't need to type anything before seeing the GRASS GIS Manager. Copy grass60.bat to c:\cygwin and run it! You can make a shortcut to c:\cygwin\grass60.bat. 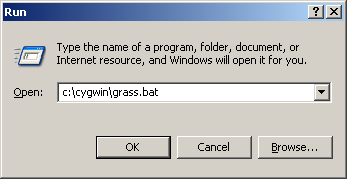 John Robertson, one of winGRASS users, presented me a GRASS icon. You can apply this to grass60.bat. 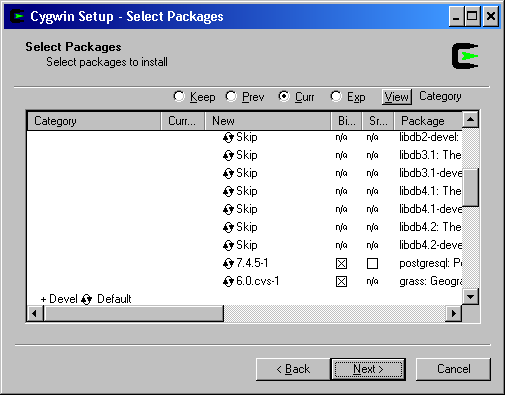 If you installed grass-cvs, download grass/grass61.bat. grass/tcltk-grass-8.4.7-1.tar.bz2 You need this version of tcl/tk instead of the cygwin package. If some errors are found, you may want to run grass/fixdll.sh after exiting GRASS. NOTE: You may not want to compile 6.1 yourself if you're an average user. NVIZ compiled with the tcl/tk cygwin version doesn't work because this package is MS-Windows native, so I've built the whole library from the sources with little modification and it worked as an X11 version on cygwin! When you compile GRASS yourself, make sure that you give "--with-tcltk-includes=/usr/local/include --with-tcltk-libs=/usr/local/lib" option to ./configure.sh. Any comment or question is welcome. Subscribe to the winGRASS mailing list. If you have a question about my package, please read Q&A Wiki carefully before asking for help. Many common questions are aleady answered. Please visit wiki_cygwin_grass for Cygwin packages (now deprecated by MS-Windows native GRASS). THIS SOURCE PACKAGE IS NOT OFFICIALLY SUPPORTED BY THE GRASS TEAM. Since a new display architecture is being developed and no more bug fixes or code changes are guaranteed for this distribution, use it at your own risk. This work was derived from the 2006-02-18 CVS version and you can read related threads at http://www.grass.itc.it/pipermail/grass5/2006-February/021324.html. 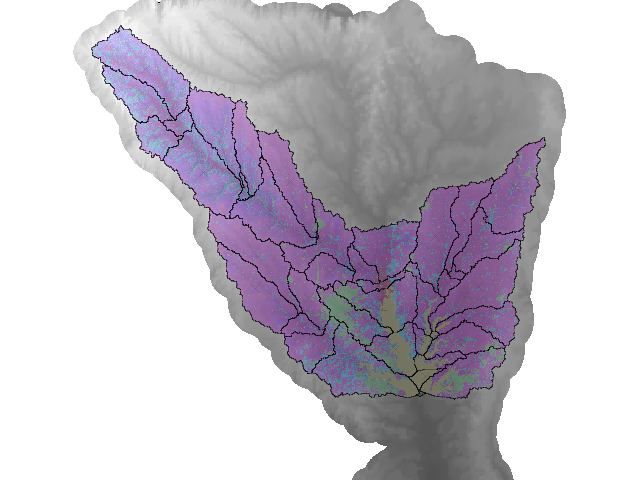 TOPMODEL (Topography Model) is a physically based hydrologic model. 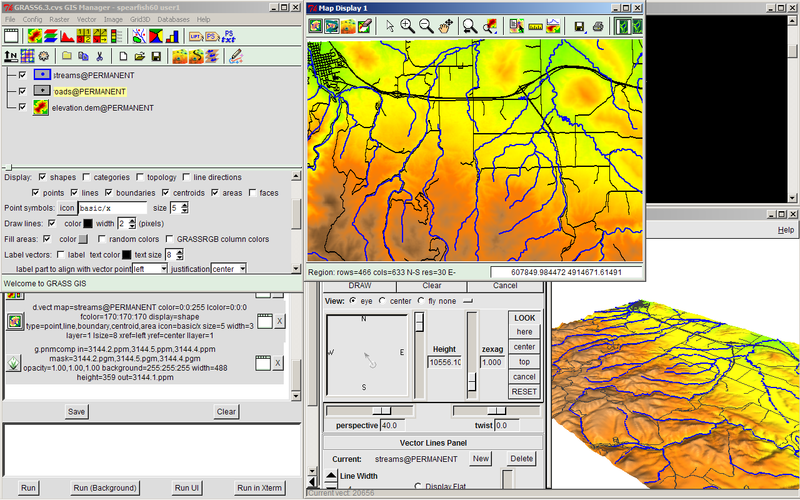 TMOD9502.FOR and GRIDATB.FOR have just been ported to the GRASS modules (r.topmodel and r.topidx respectively) to accommodate interoperability with GIS. grass/r.out.gmt exports a raster map into a GMT grd file. grass/v.out.gmt exports a polygon vector map into a GMT xy file. 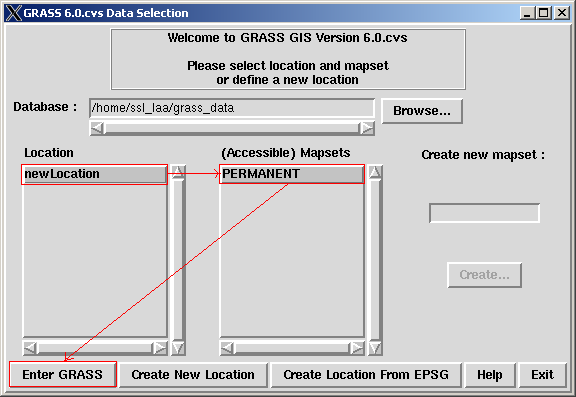 grass/d.edit.rast edits cells in an existing raster map displayed on the monitor. Download GLOBE data and the corresponding Arc/Info header. Start grass in any location. Exit and restart grass with the latlong location. Exit and restart grass with the nad83 location. Wed Apr 3 21:57:29 2019 . XHTML . CSS (lightbox.css is not part of Uniqki. ;-) . Powered by Uniqki!